You see it everyday, you just might not realize it. If you’ve heard the term you may associate it with what mainstream society would consider extreme examples. Maybe you read an article in a tech magazine about the implantation of an RFID chip into a person’s forearm. Perhaps you’ve met someone who creates intricate patterns in their skin through the process of scarification. These people are indeed bodyhackers, but so is your hairstylist, and your barista, your realtor, and probably even your grandmother. That’s because tattoos, hair dye, cosmetic surgery, bodybuilding, meditation, prosthetic limbs, medical implants, even wearable tech like smartwatches are all types of bodyhacking. That’s because bodyhacking is a catch-all phrase that covers anything one can currently do to alter one’s body. While there are many, “further down the line” applications, bodyhacking typically focuses on present, real, concrete applications. 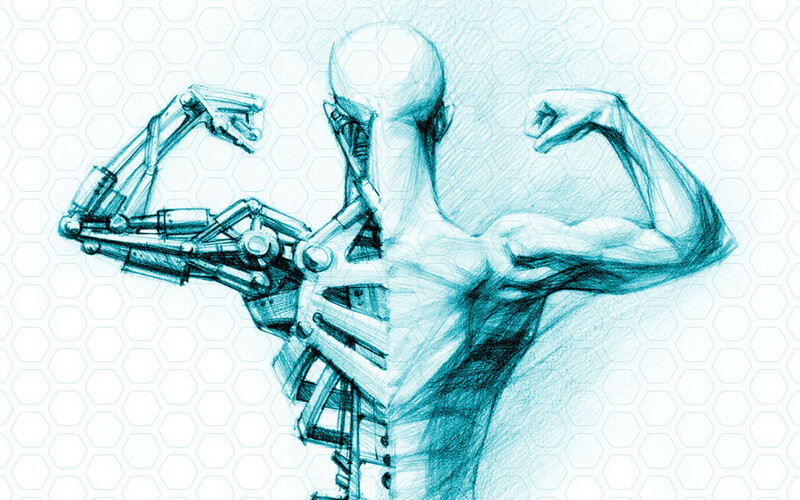 Biohacking is another term that gets tossed around in the same circles as bodyhacking. Although the two overlap considerably there are large differences. In its simplest form biohacking is more of a do-it-yourself approach to biology. Biohackers include everyone from grinders who are working to expand human senses and abilities in their homes or private labs, to others who are modifying plant or animal genetics to achieve a specific result such as color changing flowers or bacteria that can eat waste plastic. Anything worn to improve your ability to track and measure your own data for personal growth, improving your workout, guiding you to your destination, or for enhancing your ability to sense the world around you or for other reasons. Smartwatches, hearing aids, even GPS fall into this category. Whether it’s temporary like hair dye, or permanent like orthodontics, tattoos, and cosmetic surgery anything done to alter the appearance of the body counts. This also includes functional body modifications like implanted magnets or RFID chips. As prosthetics and cybernetics advance they are becoming a large part of this category and of bodyhacking in general. There are many ways to shape the body without using the likes of surgery. From bodybuilders bulking up and sculpting each muscle, to yogis and pilates practitioners elongating muscles and gaining flexibility, every one of them is a bodyhacker. Sometimes it’s what on the inside that counts. The use of wearable technology, meditation, vitamins, and nootropics (like imodafinil) to influence your brain’s processing capability are a very unique and often overlooked type of bodyhacking. With all the commonalities and overlap between different types of bodyhacking it’s easy to understand why it’s so important for all bodyhackers, regardless of their chosen method, to interact with each other. All of them are trying to improve themselves, actively pursuing what they believe to be their own, personal, ideal self. The shared experience of BDYHAX could hold the keys to furthering both the bodyhacking movement and many, unique personal journeys.